Approved RetailerCrosswater Glide II Wall Hung Vanity Unit and Marble WorktopFrom £406.00 inc.VATRRP: £580.00 (Save 30%)Adding a Carrara marble-effect solid surface worktop allows you to create your own style of countetop basin vanity unit. 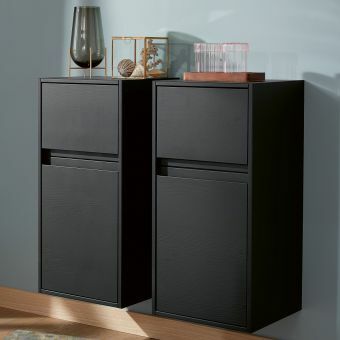 VitrA Integra Tall Unit Storage CabinetFrom £387.20 inc.VATRRP: £484.00 (Save 20%)1550mm tall storage unit with 7 shelves, internal adjustable glass shelves in 3 different stlyish colour combinations. 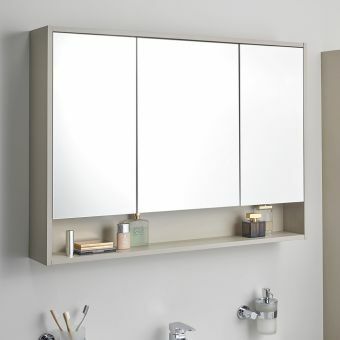 VitrA Integra Large 100cm Mirror CabinetFrom £490.40 inc.VATRRP: £613.00 (Save 20%)100cm wide cabinet in 3 stunning colours: Grey Elm, Bamboo or Walnut. 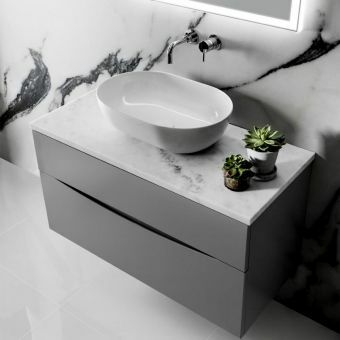 Suits the 100cm Vanity unit, or any Integra piece. 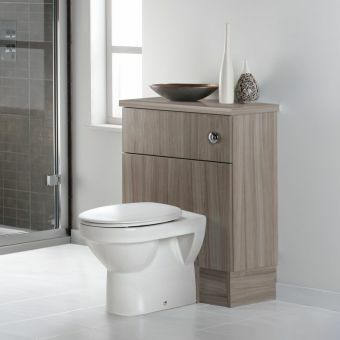 VitrA S50 Toilet Furniture UnitFrom £220.35 inc.VATRRP: £339.00 (Save 35%)Toilet furniture WC unit from the S50 range in 2 colours white or oak, with cistern & button! Great value. VitrA Ecora 3 Drawer Vanity UnitFrom £484.25 inc.VATRRP: £745.00 (Save 35%)Maximum family bathroom storage with 3 soft closing drawers! 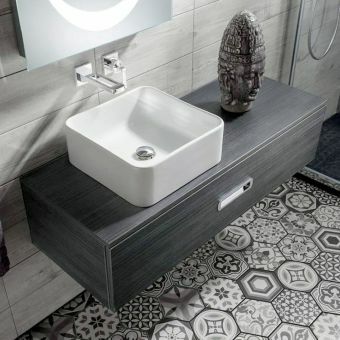 Stunning unit & basin package at a fantastic price. VitrA D Light Tall UnitFrom £338.65 inc.VATRRP: £521.00 (Save 35%)Tall unit with soft close right hand hinged door, 1135mm in height with optional towel hook upgrade, 4 colours! 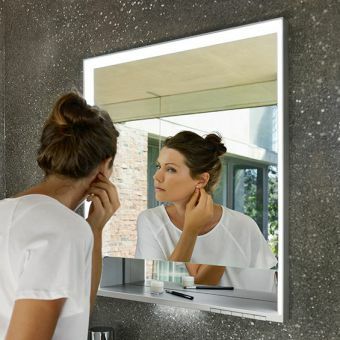 VitrA Frame Double Door LED Mirror CabinetFrom £1146.41 inc.VATRRP: £1433.00 (Save 20%)In 3 sizes of: 800, 1000 or 1200mm. Two soft closing doors with energy saving LED lighting. 3 colour choices. VitrA Nest Trendy 80cm Compact 2 Door VanityFrom £703.20 inc.VATRRP: £879.00 (Save 20%)VitrA Nest and Nest Trendy are perfect for young families, with soft safe round edges and soft opening doors. Vitra M-Line Tall Storage UnitFrom £237.60 inc.VATRRP: £297.00 (Save 20%)Choose from 3 colour options: Gloss grey, Gloss white or Dark elm. Wall mounted with soft close hinges. VitrA Sento Oak Console£164.80 inc.VATRRP: £206.00 (Save 20%)Large 95cm oak console, part of the coveted VitrA Sento collection, supports Sento storage units. 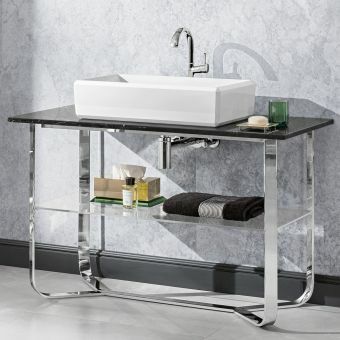 V & B Antheus Steel & Marble WashstandFrom £3480.00 inc.VATPolished stainless steel washstand frame with solid marble countertop, with optional matching Antheus wash bowl. Villeroy and Boch Antheus Side CabinetFrom £1308.00 inc.VATFirst class side cabinet, in American walnut or Black Ash wood colours. Left or right hand hinge. Approved RetailerBauhaus WC Furniture UnitFrom £122.50 inc.VATRRP: £175.00 (Save 30%)Wall hung or floor standing options. 6 colours to match any Bauhaus unit from any range. 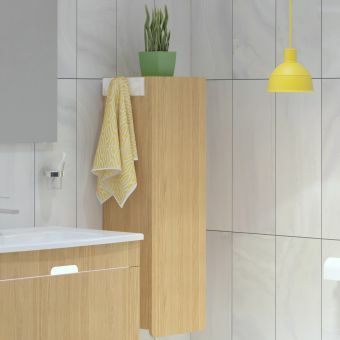 Whether you are planning a quick make over to bring your bathroom up to scratch, or you are starting over again and fitting a whole new room, getting the bathroom furniture right will make all the difference. The bathroom has become a domain where we can close the door, have some privacy, peace and quiet, relax and give yourself some pamper time. In an age where more and more cosmetic products are being pushed into the market and spa products are available to buy to use in your own home the bathroom design has had to develop to supply the tranquil, clutter free, luxurious environment where you are free to indulge and get away from the rat race. 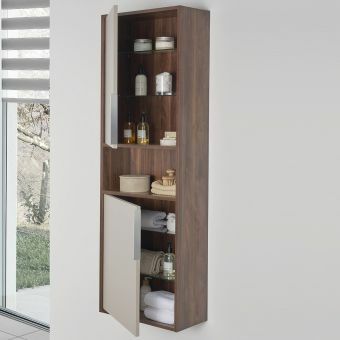 Bathroom storage and bathroom storage solutions provide the ability to de-clutter the room, keeping things neat and tidy and organised. 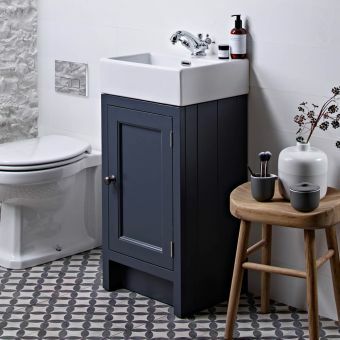 Bathroom furniture varies greatly in style, colour, size and budget and your storage solutions need to be carefully considered. 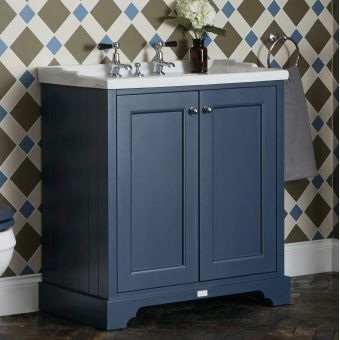 Traditionally freestanding storage solutions have been used in bathrooms. Furniture was not necessarily specific to bathrooms. 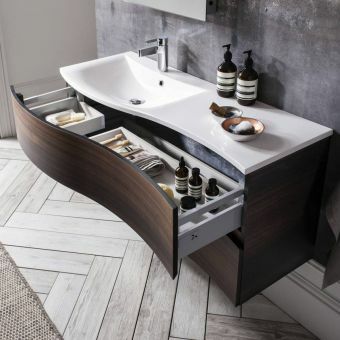 Vanity units started to become more popular. 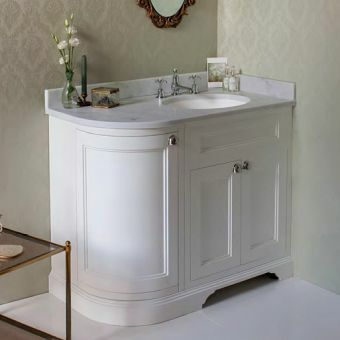 Most bathroom furniture was made to suit a specific situation and was normally bespoke. 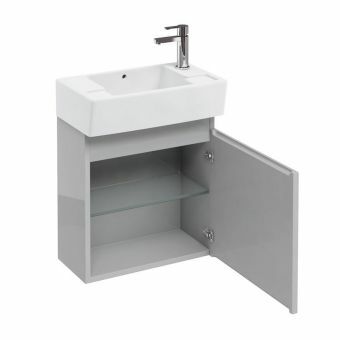 Often used to fit the basin in or on and hide the unsightly pipework beneath vanity units also provided storage for cosmetics and cleaning products. At first vanity units were mounted to the floor and were a more fitted solution. As fitted furniture developed more units sizes and options became available and consumers and designers were given more choices. 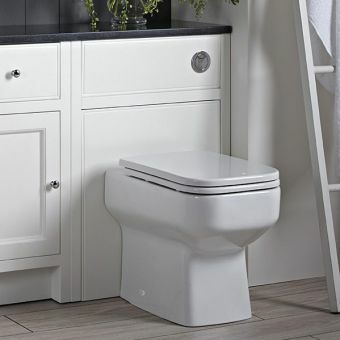 Almost like kitchen cupboards, but specifically designed for bathrooms fitted furniture was made at the correct height for the wash basin to sit on or in and was adaptable so that pipework could be hidden either underneath or behind. Like kitchen units many different colours and door styles became available in both traditional furniture and more contemporary styles. Wall and base units complimented the design with many worktop options to complete the offering. Solutions for concealing other services and even the toilet cistern became available. While many manufacturers will make fitted furniture to order there are others, such as Noble, where off the shelf products are available. Although slightly more limited in the design options and sizes available the choice is still vast and will suit, most designs. The off the shelf product can be available for delivery on a much shorter lead time. 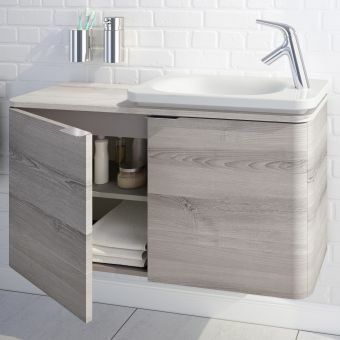 Now by far the most popular bathroom furniture solution bathroom cabinets give you a mirror to shave with or apply makeup, as well as looking great. Bathroom mirrors are more often than not illuminated. The lighting on both mirrors and cabinets tends to be a lower voltage to avoid dazzling and compliments the overall room illumination. Competition is fierce between manufacturers for market share and budgets, quality and designs vary enormously. 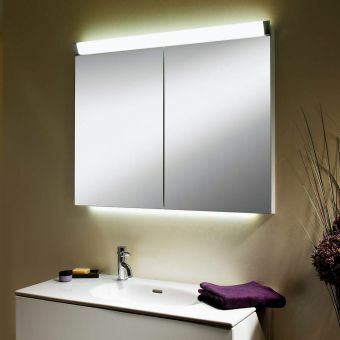 Brand names such as Keuco are market leaders in mirrored cabinets, illuminated mirrors and bathroom furniture. They constantly innovate to explore new designs which can help to create a truly luxurious room. Whilst still maintaining a large market place fitted furniture is definitely losing ground to increasing sales of freestanding and modular furniture. Often viewed by designers as a bit old hat in bathroom design it can take a lot of accurate design to get things correct. With the choices being so vast it is difficult to offer all the options online. 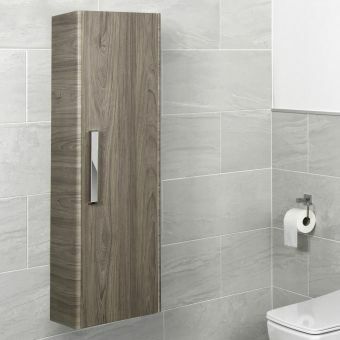 Ukbathrooms are currently working with manufacturers such as Noble. Noble furniture is currently available from us but you will have to call for us to quote at this point. It can be easier to discuss your exact options with our sales team. We are currently developing the site so you will shortly be able to easily add your choices to the basket without necessarily the need to call. 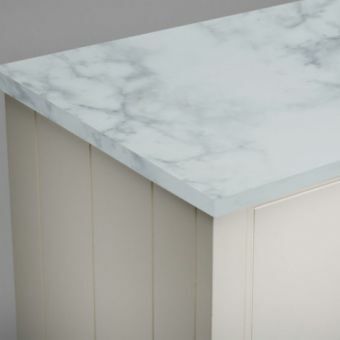 There are many other manufacturers but we have chosen Noble for now as they offer readily available in stock cabinets in a number of styles, colours and sizes. We also feel it is good value for money and great quality. 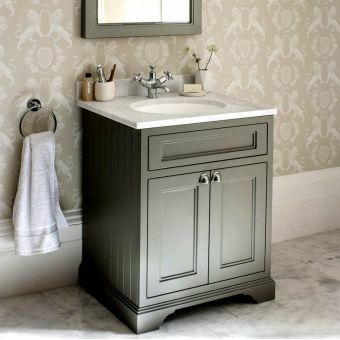 We refer to freestanding furniture in bathrooms as products that look like they are sat on their own. They are floor mounted and attached to the wall but are independent, in general, of other units around them. 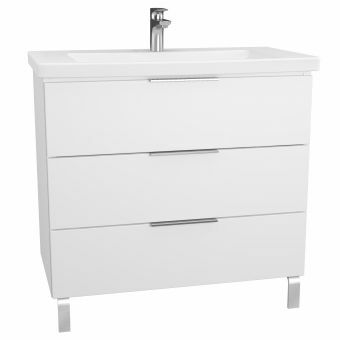 Basin units or vanity units are available in traditional and contemporary styles in many different finishes. The basin is normally required to go with the specific unit. 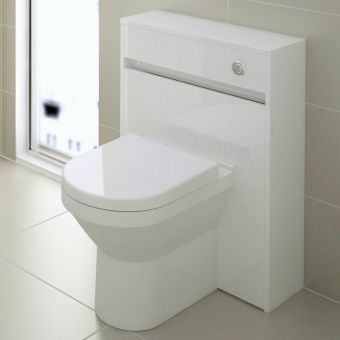 Freestanding toilet units can complement the basin unit and will normally include the cistern. 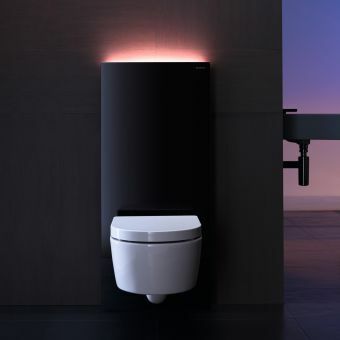 You must check that the cistern is included as some manufacturers will give you the option to purchase the cistern separately. 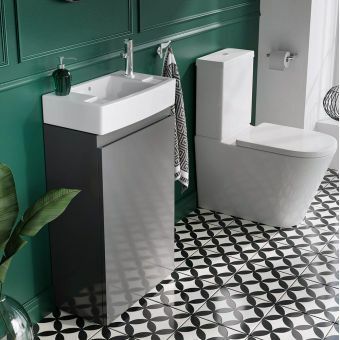 As wall mounted toilets are more popular manufacturers are now developing freestanding options to include a cistern and frame so the wall mounted pan can be mounted directly onto the furniture. 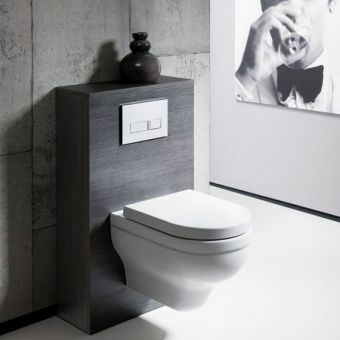 In most cases the floor mounted back to the wall toilet or the wall mounted toilet should be bought separately. Freestanding furniture is generally easy to fit and not only provides storage but can also hide pipework coming out of the floor or wall. 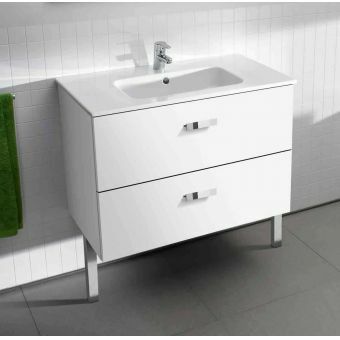 Modular furniture is a term used in the industry which you would normally associate with a wall mounted basin unit. Contemporary designs and ease of maintenance requirements have led manufacturers to produce a huge range of modular units. Although the trend is also following in more traditional styles. 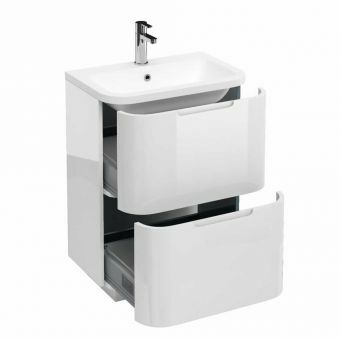 Available from small cloakroom units to large single or double basin units the options are infinite, as are the prices. 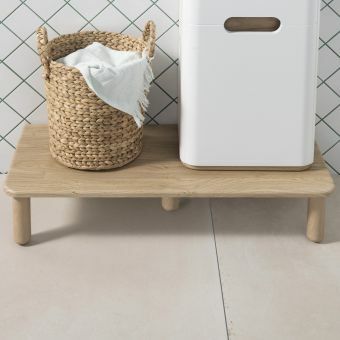 Manufacturers such as Vitra will offer good value, entry level products in their S20 and S50 ranges, amongst others while at the other end of the scale Villeroy and Boch and Keuco will offer much more versatility in the choice of size, colour and materials. Our own Origins furniture is growing all the time to give you access to some of the best quality, value for money products we can source with the widest variety of choice available. Glass and high gloss finishes are more common with the higher end manufacturers. The majority of suppliers will manufacture the units from veneer boards and use either cupboard doors or drawers to provide the storage. Most modular units will require a specific basin to match the unit but many options are also available with countertop units having different sit on basins or bowls, and under counter basins or inset basins, as options. Wall mounted cupboards in various heights and depths will also compliment most ranges and provide further storage facilities. 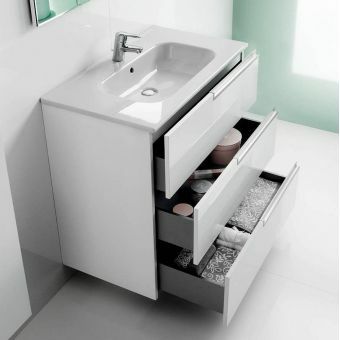 Modular vanity units are usually the full depth of the basin as so provide a deeper storage unit than many fitted ranges. They are fitted to the wall by brackets and the basin is normally fitted and supported totally independent of the unit. Sit on basins are the obvious exception here. Care must be taken in the installation to ensure the pipework is position correctly in the wall and that suitable wall fixing points are provided. 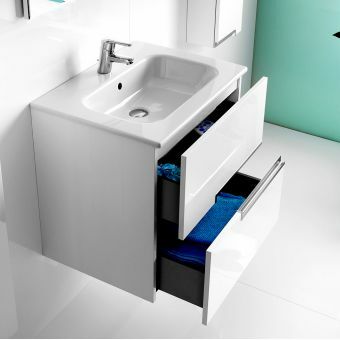 Wall mounted off the floor modular units provide ease of cleaning in the bathroom. 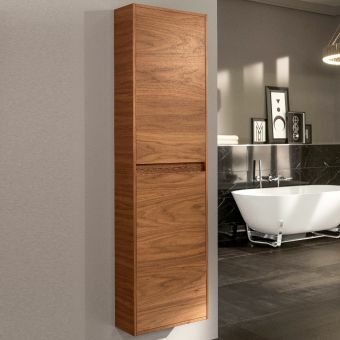 Their aesthetic appeal is very endearing and to have a luxurious look a superb storage will tick many boxes when considering a new bathroom design or refurbishment. 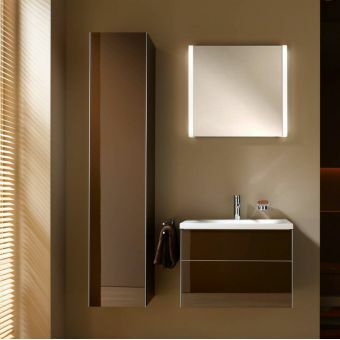 We have a large range of cabinets and mirrors at UKBathrooms. Ranges from Roper Rhodes and Abacus will be fairly similar in their quality of manufacture and vary mainly in style and sizes. Made in general using anodised side panel in cabinets with double sided mirror on cabinet doors. 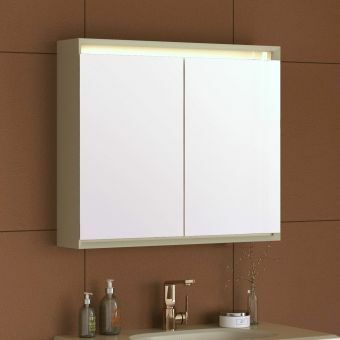 They have many features including de-mista, or heated pads to help reduce the condensation on the mirrors, as standard on some of the mirrors, touch or movement sensitive sensor switches, dimmable lighting, night lights, LED lights for greater efficiency, digitally displayed clocks, bluetooth functionality with built in speakers and charging sockets for shaver, toothbrushes and trimmers. Other manufacturers, such as Bauhaus, will offer mirrors and cabinets which complement their furniture ranges and add to the overall room styling. LED lighting technology is far more efficient and the lifespan of the bulbs is much greater. 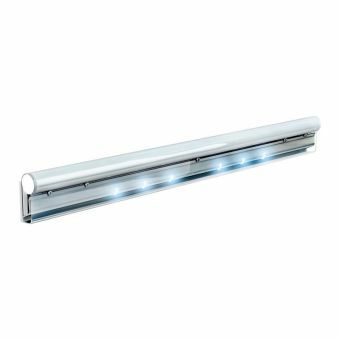 LED lighting now comes in both cool light and warm glow lighting. The different lighting styles can set the mood. A cool light for more contemporary areas and the warm light is softer which can complement a more natural style. It is also useful to be able to use the different lighting styles at different times of the day. The warm and cold LED’s will illuminate and make visibility slightly better when other ambient lighting from external sources alters. Due to this some mirrors will now offer both types and the light can be altered manually. Due to this some mirrors will now offer both types and the light can be altered manually. Many mirrors and cabinets will provide an ambient all round glow. The type and style of lighting can be important from an aesthetic point of view, but consideration should also be given to the visibility of the mirror. In our experience side lighting is better to provide better visibility for close up uses such as applying make-up or shaving. Please don’t worry too much though as the difference between top and side lighting is fairly small and can be affected from other lighting in the room or outside the bathroom. Brands such as Keuco and Schneider will take the quality of manufacturer and design to the next level. 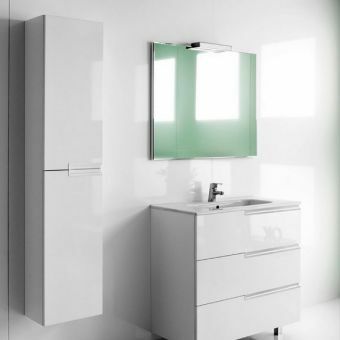 Extra features on cabinets like mirrored side panels and hidden, sleek hinge mechanisms certainly set Keuco apart. 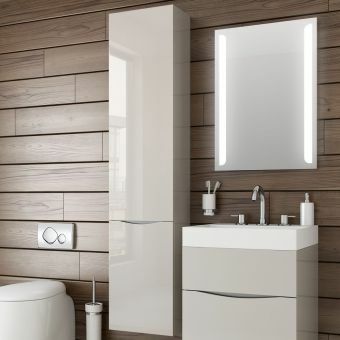 Elegant designs in all ranges and cabinets and mirrors available to complement the Keuco furniture ranges help to create the most luxurious bathrooms available.